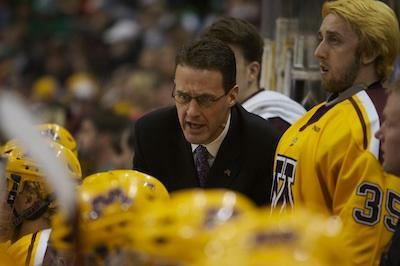 The University of Minnesota men's hockey team is now three years removed from its last appearance in the NCAA tournament and hasn't won a game at the NCAA's since defeating Air Force 4-3 on March 24, 2007. Couple that with the recent revelation that Golden Gopher hockey season ticket holders will now be required to pay a premium simply for the right to buy their tickets and fan angst is at its highest level since the final morbid days of the Doug Woog era. Gopher fans desperately needed a shot in the arm and appear to have gotten it by way of assistant-coach John Hill's departure coinciding with the rumored return of former Gopher assistant Mike Guentzel. The news hasn't exactly pacified those calling for Don Lucia's head but it seems to have stirred some interest in a once-proud program which finished last season with consecutive home playoff losses to 'powerful' Alaska-Anchorage. Rumored all weekend, the move was made official late Sunday night when the University of Minnesota released a statement saying simply that Hill would not return for the 2011-12 season. 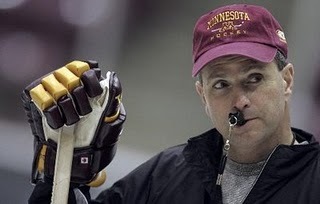 There were those at last weekend's NHL Entry Draft in St. Paul who suggested that recent contract extension discussions between Lucia and Gopher A.D. Joel Maturi may have hinged upon an changes to Lucia's staff. Whatever the reason for the change it had to be made both from P.R. and competitive standpoints. Prying Guentzel away from Dean Blais' side in Omaha to replace Hill is a scenario which for many Gopher fans could only be topped by pairing Guentzel with Blais on Minnesota's bench. Unfairly or not, Hill has long been dogged by the reputation that Lucia's coattails were all that kept him afloat in the coaching ranks. Guentzel, on the other hand, has been looked upon as a coach with D1 head-coaching potential. In fact, Guentzel did sandwich one season as head coach of the USHL's Des Moines Buccaneers between a season as an assistant at Colorado College and this past year with Blais. 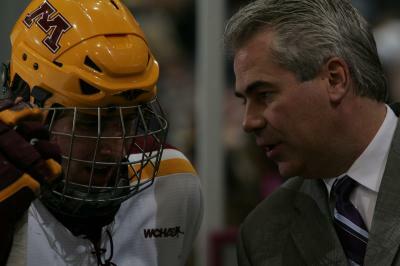 The facts are that other than the four years (2001-2005) in which he served as head coach of Alaska-Anchorage, Hill has been a member of the Gopher staff for eight of Lucia's 12 seasons at Minnesota. Unfortunately for Hill that four-year span also happens to include Minnesota's only Frozen Four appearances in the Lucia era. Hill returned to the Gophers for the 2005-06 season; a season in which Minnesota entered the NCAA tournament as the #1 seed but lost in the first round to . . . . never mind, it's not important. On the other hand, Guentzel and current St. Cloud State head coach Bob Motzko were there for all three Frozen Fours including, of course, both of Minnesota's national titles under Lucia. Additionally, Minnesota recent streak of NCAA tournament futility began the season after Guentzel and Lucia not-so-amicably parted ways in the spring of 2008. Since then the Gophers have played a frustratingly inconsistent and dispassionate brand of hockey especially considering the talent at Lucia's disposal. Minnesota badly needs an infusion of energy, heart, and guts to restore its mojo and regain its swagger. Guentzel is a coach who is capable of nurturing those attributes and aiding in steering the Gophers back toward the path to prominence. I read a suggestion today that one thing at which Hill excelled was the between-periods interview on Fox Sports North and I agree he appeared comfortable in front of the camera. Considering the painfully embarrassing commentator du jour FSN forced viewers to endure last season John Hill might just be the right guy for that full-time gig.